Map 9 comes from the Midwest High Speed Rail Association (http://www.midwesthsr.org/vision). The website is a wealth of information on the ongoing development of high speed rail implementation in the United States. The map below shows the Association’s goals for the future, a fully connected Midwest! Apparently the plan is to build two test tracks by 2020, one between Minneapolis and Rochester, MN and another between O’Hare International Airport, Chicago, and Champaign, IL. As a resident of the Twin Cities, I love the idea of being part of this test and hope the entire system gets built before I die an old man. I love to travel by car but the occasional train trip would be a nice change of pace. It would be great if I could get to St. Louis to visit my friend Katie in five hours by train instead of nine hours by car. I could use my iPad or read a book and make excellent use of my time. My coworker, Kevin, travels back and forth to Chicago to visit his girlfriend 2-3 times a month. Sometimes he flies and sometimes he drives all eight hours by himself. I’m sure he’d appreciate a faster commute! Imagine how many away-games I could see! The United States High Speed Rail Association (http://www.ushsr.com/ushsrmap.html), the parent organization of the MHSRA, has grand plans for high speed rail covering the entire country. Check out their website for more maps (they were in GIF form so I could not input them here). I welcome the idea of high speed rail throughout the country but widespread implementation is a long ways off. If I was in charge I would start by connecting Dallas to Houston, Boston to NYC and Washington D.C, and San Francisco to LA and San Diego. Minneapolis to Chicago sounds great but I’m sure there are more pressing locations nationally in terms of population (you won’t get any complaints from me though). Imagine a world where you could successfully live in Minneapolis and work an eight… six… four hour day in Chicago! After additional thought, maybe they better work on instant transportation devices too. Map 10, is based on football, also known as soccer here in the States (and pretty much only the States). 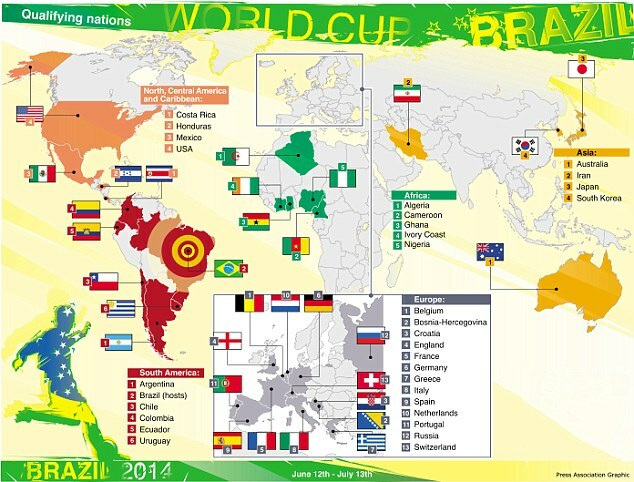 The map, which I found on Daily Mail (http://www.dailymail.co.uk/sport/worldcup2014/article-2516825/2014-World-Cup–team-team-guide.html), shows the 32 countries that qualified for the 2014 FIFA World Cup in Brazil. The Championship game is two days from now when Argentina takes on the favored Germany. Germany crushed host nation Brazil 7-1 in the semifinal stage earning worldwide attention and acclaim. My wife has been rooting for the Germans the entire tournament, even before the United States was knocked out by Belgium in the round of sixteen. Argentina won’t likely roll over in the final (like Brazil just did) but I still expect a German victory on Sunday. After all, Argentina barely pulled off enough offense to get past the Netherlands in their semifinal match. I have written about soccer before so you may know that I am just starting to get into it while my wife’s family is really involved in the sport. My father-in-law still leads the youth referee program in the suburb of Minneapolis where they live and all the Bomben children played soccer and officiated games growing up. As for the United States National Team, I’m sure this experience will help them improve for the next World Cup in four years. The Women’s tournament is next year in Canada and the United States team usually does very well. Damn I love international sporting competitions!! Too bad the next Olympics is 700+ days away. Thanks for reading this edition of Fun with Maps! If you have any notes or requests for future maps you can leave them in the comments. I can also make custom maps if you provide me with a topic. For example, states with a Major League Soccer team or countries where I would hide if I had to flee the US. Actually, those are pretty good topics. Look for those and more interesting (okay, somewhat interesting) topics in future Fun with Maps posts!